Purpose: To strengthen the Thessalonian Christians in their faith and give them the assurance of Christ's return. Setting: The church at Thessalonica was very young, having been established only two or three years before this letter was written. 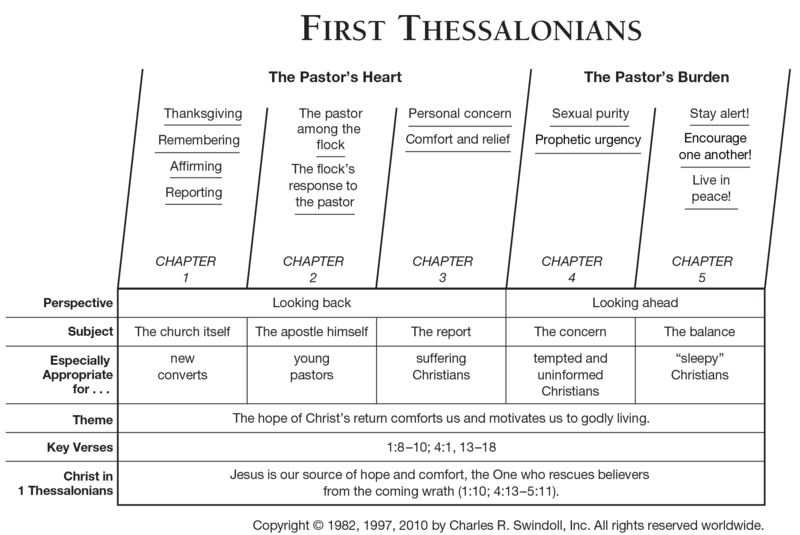 The Thessalonian Christians needed to mature in their faith. In addition, there was a misunderstanding concerning Christ's second coming - some thought Christ would return immediately; thus, they were confused when their loved ones died because they expected Christ to return beforehand. Also, believers were being persecuted. Key verse: "For since we believe that Jesus died and was raised to life again, we also believe that when Jesus returns, God will bring back with him the believers who have died" (4:14). Special features: Paul received from Timothy a favorable report about the Thessalonians. However, Paul wrote this letter to correct their misconceptions about the resurrection and the second coming of Christ. Christ comes to receive His church in the air. Christ returns with His bride and angels to the earth. The seven-year tribulation begins shortly after the rapture of the church. The millennial kingdom (1,000 years) of Christ is established after His return. The event is imminent; it could happen at any time. This is a message of comfort for believers. This is a message of judgment (and warning) for unbelievers. The church is of primary importance. Israel is of primary importance. The rapture is a mystery. Christ’s return is predicted in both the Old and New Testament. The judgment seat of Christ for believers occurs. (1) The sheep and goats’ judgment occurs (Matt. 25:31–46). (2) Antichrist and the world are judged (Rev. 19:11–21). The church is taken into the Lord’s presence in heaven. All believers are brought into the millennial kingdom to reign with Christ on earth. New Geneva study Bible. 1997, c1995 (electronic ed.) (1 Tes 4.14). Nashville: Thomas Nelson. 5:11 Build each other up. Point out to someone a quality you appreciate in him or her. 5:12 Honor leaders. Look for ways to cooperate. 5:13 Show leaders Hold back your next critical comments about those in positions of responsibility. Say "thank you" to your leaders for their efforts. 5:13 Live in peace Search for ways to get along with others. 5:14 Warn the lazy. Challenge someone to join you in a project. 5:14 Encourage the timid. Encourage those who are timid by reminding them of God's promises. 5:14 Help the weak. Support those who are weak by loving them and praying for them. 5:14 Be patient. Think of a situation that tries your patience, and plan ahead of time how you can stay calm. 5:15 Resist revenge. Instead of planning to get even with those who mistreat you, do good to them. 5:16 Be joyful. Remember that even in the midst of turmoil, God is in control. 5:17 Pray continually. God is always with you - talk to him. 5:18 Give thanks. Make a list of all the gifts God has given you, giving thanks to God for each one. 5:19 Do not stifle the Holy Spirit Cooperate with the Spirit the next time he prompts you to participate in a Christian meeting. 5:20 Do not scoff at prophecies. Receive God's word from those who speak for him. 5:22 Avoid every kind of evil. Avoid situations where you will be drawn into temptation. 5:23 Count on God's constant help. Realize that the Christians life is to lived not in our own strength but through God's power. 2. Watchfulness for the Lord (4:1-5:28) Paul and his companions were faithful to bring the gospel to the Thessalonians in the midst of persecution. The Thessalonians had only recently become Christians, and yet they had remained faithful to the Lord, despite the fact that the apostle were not with them. Others have been faithful in bringing God's Word to us. We must remain faithful and live in the expectation that Christ will return at any time.